In 1992 a moderately successful film, Buffy the Vampire Slayer hit the screens, her story could have ended there had not Joss Whedon taken the central idea and crafted what is conceivably one of the most successful genre shows of the twentieth century. 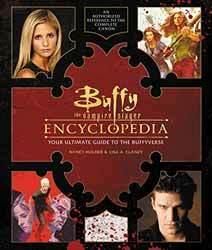 Buffy the Vampire Slayer Encyclopedia: The Ultimate Guide to the Buffyverse (2017. 207 pages), is written by Nancy Holder and Lisa A. Clancy. Published on the twentieth anniversary of the show the coffee table book is printed on high gloss paper and comprehensively covers everything about the series. The show started in 1997 with a new lead actress with Sarah Michelle Gellar replacing Kristy Swanson in the title role. The show subsequently ran for seven seasons and spawned a spinoff series in Angel, as well as canon comic books. The officially authorised encyclopedia covers the original show, Angel and the comics and comes with fully cross-referenced entries. The pages are generously filled with colour stills and illustrations. Each entry is short, anything from a couple of lines to a paragraph. The main characters and places get longer entries, with Bufffy getting four whole pages. As a companion to the show there is little to fault the book and would make a good companion to the show for any long-term fans, as well as new fans, catching it on streaming services.